INDIANAPOLIS (June 17, 2015) — Klipsch, a leading global speaker and headphone manufacturer, today announces the launch of its KI Series II permanent installation speakers. The updated series includes seven new speaker models (KI-102-II, KI-102-T-II, KI-172-II, KI-262-II, KI-272-II, KI-362-II, KI-396-II) and two subwoofers (KI-115-II, KI-215-II) made for the sound reinforcement market. 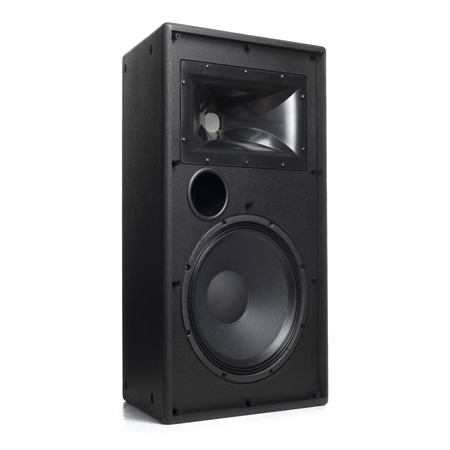 The KI Series II permanent installation speakers address the specific needs and performance standards of the sound reinforcement industry with rock-solid reliability. The speakers offer a high level of operational convenience and versatility. Each speaker delivers a high continuous SPL, is available in three finishes – black, white and a stainable raw, and is proudly Designed & Assembled in the USA. All nine models, including the subwoofers, have integrated fly-points to suspend them overhead. In addition, they have new inputs and have undergone cosmetic improvements. The KI-102-II, KI-172-II, KI-262-II and KI-272-II speaker models specifically now have updated high-quality, heavy-duty drivers and larger voice coils for increased power handling and higher sensitivity. The KI-102-T-II (70V version) employs the same high-quality components as the KI-102-II with a heavy-duty 60W transformer. All KI models use Klipsch’s proprietary Tractrix® Horn technology, which provides unrivaled low-distortion clarity and detail while long-throw woofers produce powerful low frequency response. Because of Klipsch’s expertise in efficient speaker design, the KI Series II permanent installation speakers are able to provide maximum output with minimum wattage. The addition of ellipses or “Mumps” molded into calculated areas of the Tractrix Horn on the KI-102-II, KI-102-T-II, KI-172-II, KI-362-II and KI-396-II models further enhance coverage across the dispersion area of the horn. Ideal for virtually all permanent sound reinforcement installations and production environments including theaters, houses of worship, school auditoriums, restaurants and nightclubs, the KI Series II permanent installation speakers deliver unrivaled performance and value. All Klipsch KI Series II permanent installation speakers are sold individually and are now available through authorized dealers. For more information on the Klipsch brand and its product offering, visit Klipsch.com/pro. For over 65 years, Klipsch has designed premium loudspeakers for those who are passionate about great sound. Company founder Paul W. Klipsch started this legacy in 1946, and it continues today with continuing commitment to innovation and delivering the world’s most powerful, detailed and emotional sound reproduction. Today, the brand’s diverse commercial product portfolio encompasses professional cinema, permanent installation, and distributed audio. As one of the first U.S. loudspeaker companies, Klipsch continues to be the high-performance brand of choice for applications where sound matters. Klipsch Group, Inc. is also a wholly-owned subsidiary of VOXX International Corporation (NASDAQ: VOXX).